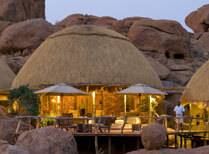 This small, personal tented camp enjoys a unique setting in central Namibia, nestled amongst enormous granite boulders. 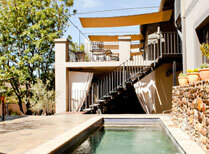 An attractive guest house with indoor and outdoor relaxation areas and a swimming pool in a quiet suburb of Windhoek. 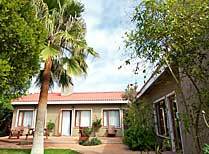 Located on the quiet and up-market side of town and just a short walk from Windhoek's bustling centre this immaculate B & B is the perfect stop-off for your Namibian safari adventure. 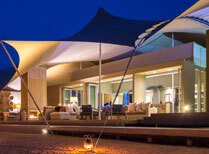 This exclusive camp with just 9 rooms offers warmth and comfort in a private setting in Namibia's Central Highlands. 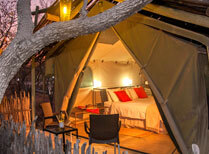 Recently rebuilt, Okonjima Plains Camp offers excellent and affordable accommodation at the home of the AfriCat Foundation. 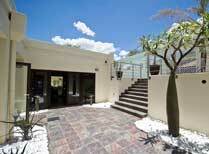 A warm welcome in a friendly and stylish guesthouse in a quiet Windhoek suburb. 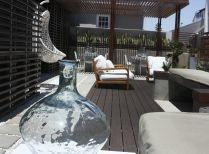 Explore Windhoek from your luxury base at this small, contemporary boutique hotel, enjoy all the extra touches. 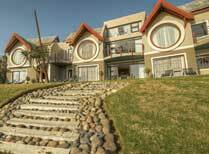 Beach Lodge has a stunning ocean front setting, tasteful accommodation and a fine restaurant, just 6kms from the centre of Swakopmund. 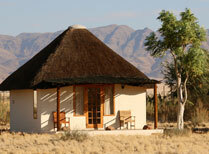 Perfect for the independent traveller, comfortable, affordable self-catering accommodation close to Sesriem and Sossusvlei. 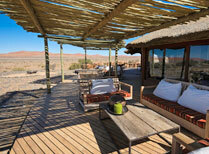 A relaxed and unpretentious option for those wishing to explore Sossusvlei and the Namib-Naukluft National Park. 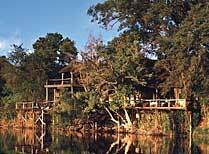 A delightful owner-run property 2km from Aus. 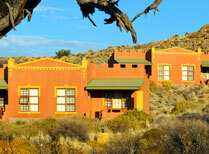 An ideal base for visiting Luderitz and the wild horses of Aus. 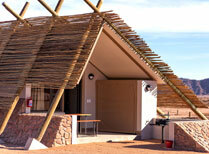 A self-catering lodge in a desert setting from where you can visit the sand dunes, canyons and wildlife of Sossusvlei. 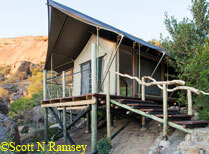 A quirky collection of 8 cottages built into the hillside. 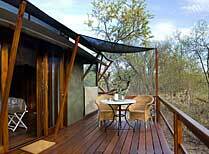 A good place to get away from it all and absorb the beautiful natural surroundings in almost solitary splendour. 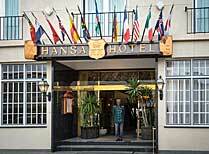 Hansa Hotel is a handsome early 20th century building in th heart of Swakopmund with a choice of rooms and suites, 2 restaurants, a lounge and bar. 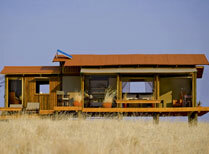 A luxurious camp, isolated, only accessible by light aircraft. 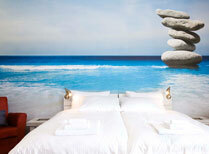 Surrounded by lunar landscapes, and a seemingly endless sky. 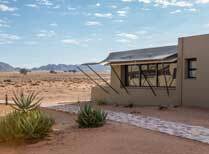 Surrounded by red dunes, desolate mountains and gravel plains, Kulala Desert Lodge is set in the heart of the beautiful and desolate Namib Desert. 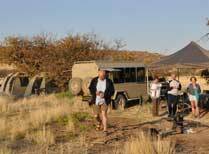 Non-participation camping lets you travel to remote areas and enjoy being in the great outdoors, star gazing, and enjoying dinner cooked over the fire. 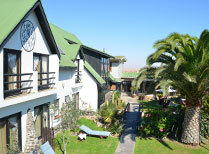 A friendly, owner-run guesthouse close to the centre of Swakopmund. 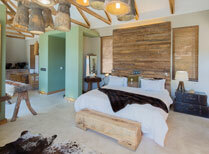 Enjoy Sam's vivacious personality together with his friendly dog, Beethoven. 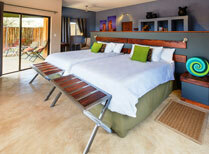 A sophisticated family run guest house, set in a peaceful and quiet Swakopmund suburb, close to the beach. 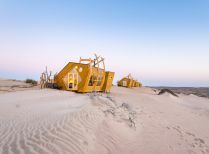 Stay at this unique lodge and experience the desolate, yet captivating Skeleton Coast. 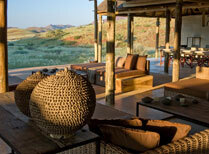 A perfect option for exploring Namib-Naukluft NP and the iconic Sossusvlei Dunes is the friendly Sossusvlei Lodge. 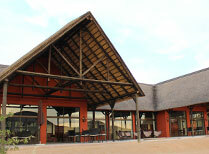 Located on the harbour's edge this resort-style hotel overlooks the ocean on three sides. 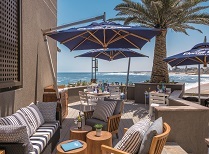 The beach, the spa and Swakopmund's bustling centre are all waiting to be explored. 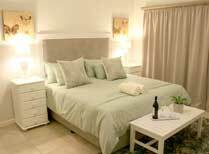 This family run guest house is just 5 minutes walk from the beach and from the centre of this quaint coastal town. 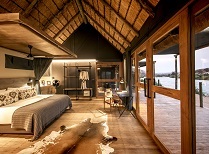 After a day of exploring retire to the peace and tranquility of your suite, a stone's throw from Swakopmunds beach, restaurants, bars and boutiques. 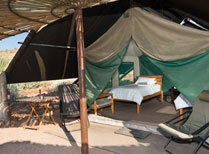 Huddled in the rocks in the Abu Huab valley is the hidden gem of Camp Kipwe. 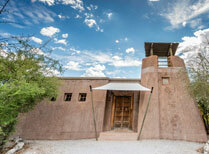 Quirky, natural touches add a perfect finish to this unique oasis in the desert. 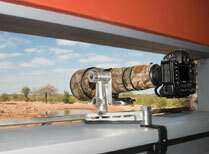 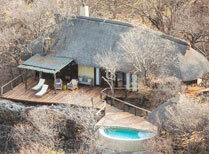 Stay in this remote wilderness area and experience the adventure of tracking black rhino on foot. 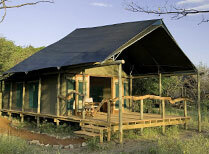 A simple, down-to-earth small tented camp at the foot of the Grootberg Massif, surrounded by beautiful scenery. 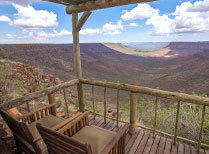 Perched on a hillock commanding breath-taking views. 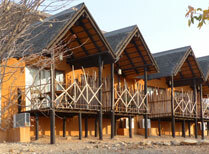 At just 9km from Andersson Gate, Etosha Safari Lodge is a great base from which to visit Namibia's jewel, Etosha National Park. 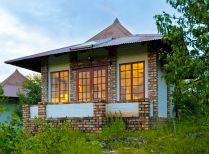 A community-owned lodge with stunning valley views offering elephant and rhino tracking and visits to the Himba community. 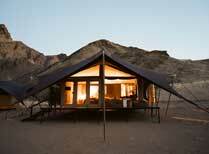 Exclusive camp in a remote valley setting, where you can see desert-adapted wildlife and meet local tribespeople. 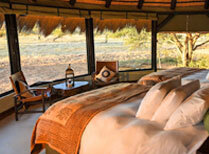 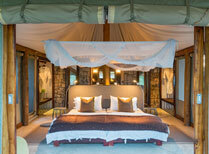 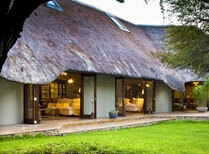 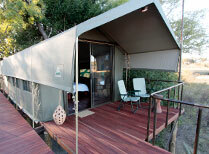 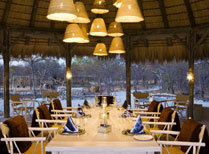 Ichingo Chobe River Lodge offers luxury tented accommodation in a quiet island in Namibia waters. 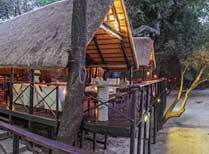 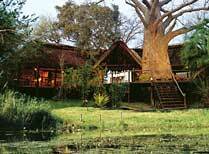 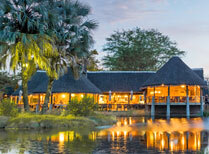 Kaza Safari Lodge is set in a landscape of waterways, islands and floodplains in Namibia's Caprivi Strip. 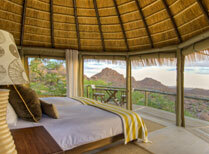 Lianshulu Lodge in Namibia combines exceptional rooms with beautiful scenery and a range of wildlife viewing activities. 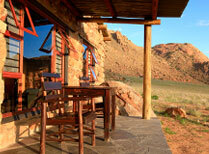 An upmarket lodge, in a stunning location, perched on a rocky outcrop in Namibia's beautiful Damaraland. 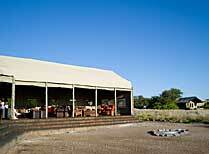 Stay in the remote Caprivi region and enjoy genuine Namibian hospitality just 300m from Nkasa Lupala National Park. 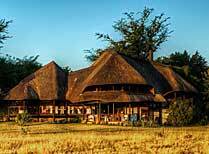 Opuwo Country Lodge is built on a hill overlooking the surrounding valleys and hills, a good base for exploring Kaokoland. 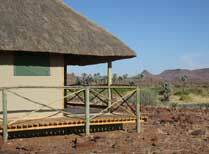 Homely accommodation in a lovely setting in wildlife-rich Damaraland, offering game drive, guided walks and rhino tracking. 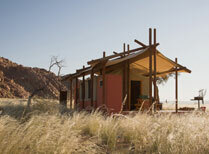 This is about as remote as you can get, a beautiful setting on the banks of the Kunene river in northern Namibia. 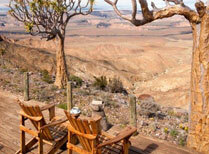 Set at the edge of the Fish River Canyon, the lodge has superb views and offers guided excursions by vehicle and on foot.